Since its inception, stARTup’s mission has been to champion under-represented and under-recognized artists, and to empower them in their careers. This includes artists of different races, sexual-orientation, genders, and abilities. 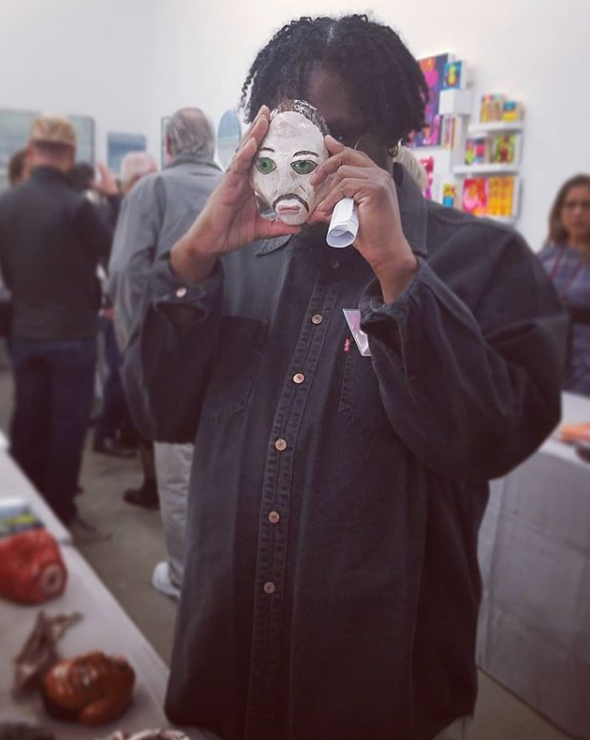 At stARTup LA 2019 we’re proud to feature two artists whose works were developed at the ECF Art Center South L.A. studio, a progressive space that supports the practices of adult artists with developmental disabilities. ECF's approach of collaboration and mentorship has been the catalyst for hundreds of artists to achieve their personal and professional goals, and their Downtown Art Center Gallery also creates opportunities for artists to interact with members of the broader art community. Artists Jennifer Little (left) and Willie Walls (right) will be exhibiting in Room 208. Jennifer’s practice voraciously focuses on all things textural. Her sculptures are an extension of her curiosity and physical energy. These audacious objects exist in response to and as a reminder of the experiences and energies that spoken and written language cannot sufficiently translate. She fuses glitter, glue, paint drips, fabrics, sequins, cardboard, and anything tactile within her reach in order to create objects that demand sensorial engagement. Willie’s mixed media practice spans over three decades. In his paintings, drawings, prints, and three-dimensional works, a checkerboard pattern emerges throughout, an unifying aesthetic and symbolic thread. This pattern gives form and becomes a character in and of itself, enveloping and contouring the work. His drawn figures have a distinct aesthetic repetition that borders on the surreal. His practice has most recently been concentrated on creating three-dimensional utilitarian objects — such as pieces of furniture and clothing — further manifesting the pattern that has so fascinated him. Willie’s objects are meant to be lived and aged with, and together with Jennifer’s sculptures, will live in Room 208 at The Kinney Venice Beach. But Jennifer and Willie aren’t the first artists with disabilities who’ve exhibited at stARTup. A studio artist at SF non-profit Creativity Explored, Gerald Wiggins exhibited at our first edition of stARTup Small Works. Creativity Explored gives artists with developmental disabilities the means to create and share their work with the community, celebrating the power of art to change lives. Gerald's work is inspired by his family and the characters he encounters in his life. Born and raised in Hunter's point in San Francisco, Gerald's artwork takes deep root into unique personalities and the existing relationships between them. His ceramic sculptures range from frightening vampiric characters to a rotating cast of life-like city dwellers he calls "the crew." Fair Director Ray Beldner was so taken by this member of “the crew,” that he had to take it home — a sentiment that was shared by many who attended stARTup Small Works. Gerald was one of the few artists to completely sell out his table! But sales weren’t Gerald’s only goal. He makes art because “I'm just trying to make [people] happy, because there is not enough happiness." Gerald was also a panelist at stARTup SF 2018’s “Creativity Can Come From Anywhere” panel, available for view below. There are tried and true frameworks designed to engineer outcomes and guarantee results and there are also outcomes that emerge from those who choose to follow a more intuitive sometimes less structured path. At stARTup SF 2018 we joined In/Visible Talks in conversation with Creativity Explored and examined the creative motivations that underlie outsider artists.